By Sean Jones: Danny Jacobs and Saul Canelo Alvarez will have a strict 170 pound rehydration clause for their May 4 fight on DAZN, according to Mike Coppinger of RingTV. This means that neither fighter can can come in higher than 170 pounds for the 8 am, second-day weigh-in on the morning of the fight. From the short 5’8″ Canelo’s perspective, it’s understandable why he would want a rehydration clause in his contract with the much bigger Jacobs. The New Yorker looks like a boiled down super middleweight, who chooses to fight middleweight against smaller fighters than competing in a weight class that would be more natural for his size at 168. Canelo obviously doesn’t want to be facing a guy that has a 10 to 15 pound weight advantage over him on the night of the fight. A rehydration clause is one way for Canelo and his promoters at Golden Boy Promotions to have a more even playing field against the bigger 5’11 1/2″ Jacobs on May 4. Jacobs’ first 17 fights as a pro were at super middleweight. Further, 24 of Jacobs’ 37 fights as a pro have been with him fighting over the 160 pound weight limit. Jacobs’ weight in most of those fights was a little over 160 lbs, but he was technically still fighting at super middleweight due to his weight being above the middleweight limit of 160 lbs. Why Jacobs chose to fight at middleweight instead of super middleweight is unknown. Did he do this to gain a weight advantage over smaller fighters than himself or did he see the 160 lb division one that had bigger fights for him? Back when Jacobs first turned pro in 2007, the super middleweight division had a lot of lions like Andre Ward, Adonis Stevenson, Mikkel Kessler and Carl Froch fighting in that weight class. Jacobs would have had a hard time beating any of them. Choosing to fight at 160 was a safer route for Jacobs. The weight penalty will be $300,000 per pound over the limit, according to RingTV. If either fighter comes in overweight, it could be costly. With Canelo recently getting a huge $365 million, 5-year contract with DAZN, one would assume that the weight penalty would be nothing for him. Even if Canelo comes in over the 170 pound limit by 10 pounds, it’s still not a true deterrent for him. It obviously is for Jacobs though, which is why weight penalties this arguably hurt fighters that aren’t as wealthy. It’s a penalty that impacts the B-side fighter more than A-side guy. For it to hurt Canelo, they would have to have separate penalties for each fighter if they fail to make weight. For example, for Jacobs it could be $300,000 per pound. For Canelo, something like $5 million per pound. That would make a lot more sense in this writer’s opinion than having a $300,000 per pound weight penalty, that hurts Jacobs, but might not necessarily be a deterrent for the fabulously wealthy Canelo. However, Canelo isn’t likely to come in overweight. He’s a true professional, and he wants to make weight so that he can unify the middleweight division. 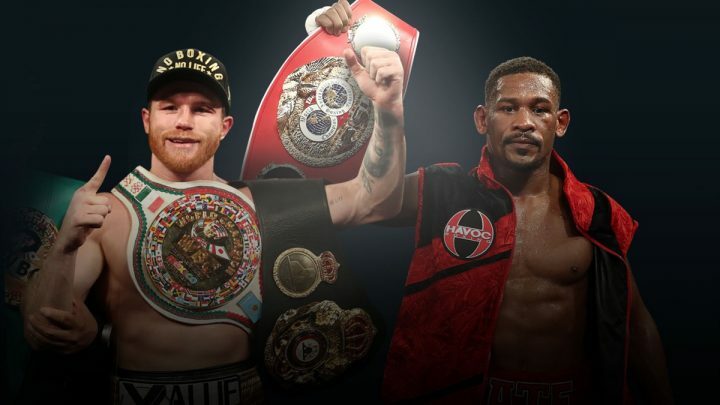 Obviously, Canelo is not going to balloon up in weight to try and gain an advantage over Jacobs, because then he won’t be able to capture his IBF title, which he wants to win. If Canelo beats Jacobs, he’ll have three of the four titles at 160. Canelo currently holds the WBA/WBC middleweight belts that he recently won off Golovkin last September. A victory for Canelo over Jacobs on May 4 will mean that the only strap not in his possession is the WBO title held by Demetrius Andrade. The way Andrade fought last Friday night in beating Artur Akavov, Canelo would be seen as a huge favorite to beat him. Andrade did not look anywhere near the class as Canelo, Jacobs, Golovkin or Jermall Charlo in terms of talent. It’s a foregone conclusion that Canelo will soon be the unified middleweight champion of the world. Canelo can do that this year or he can wait until early 2020 to go after Andrade’s World Boxing Organization title. It’s up to Canelo, as he calls the shots. The decision to have a rehydration clause would seem to be aimed at keeping Jacobs (35-2, 29 KOs) from rehydrating a massive amount overnight after he makes weight at the weigh-in on May 3. Jacobs, 31, skipped the International Boxing Federation second day weigh-in for his title challenge against former IBF/WBA/WBC middleweight champion Gennady Golovkin (38-1-1, 34 KO) for their fight on March 18, 2017 at Madison Square Garden in New York. By skipping the second day weigh-in on the morning of the fight, Jacobs was able to use the extra time to rehydrate, while Golovkin had to limit his fluid intake to make weight in order to keep his IBF title. It’s unclear what impact this had on the GGG-Jacobs fight. Golovkin still won the fight by a 12 round unanimous decision, but he seemed to struggle in the second half of the contest after he gassed out. Whether that was because of having to make weight for the IBF’s secondary weigh-in on the morning of the fight is unknown. A lot of boxing fans noted how much bigger looking Jacobs was then Golovkin during the fight. However, there was no way of knowing how much Jacobs rehydrated, since he didn’t get weighed in by HBO on the night of the fight. Some boxing fans believe Jacobs was between 185 and 188 lbs when he stepped foot inside the ring. That would mean that Jacobs rehydrated 25 to 28 pounds before facing Golovkin. That’s a lot of weight for a fighter to put back on. Golovkin was in the low 170s on the night of the fight. If Jacobs did come into the fight in the mid to upper 180s, then he had a little over a 10 pound weight advantage over GGG. It’s not the weight that necessarily would impact a fight like that. It’s that one fighter had to withhold fluids until after the secondary weigh-in the morning of the fight, while the other fighter, Jacobs, was able to rehydrate without worrying about limiting his fluid intake. Jacobs, 31, recently captured the IBF 160 lb title in beating Sergiy Derevyanchenko by a close 12 round split decision on October 27. Jacobs did just barely enough to win the decision over the 2008 Ukrainian Olympian Derevyanchenko. For Jacobs, it was his third consecutive unimpressive performance since his loss to Golovkin in 2017. This fueled speculation that Jacobs isn’t the same fighter he was two years ago due to the punishment that he absorbed in his loss to Golovkin. Although Jacobs spent the first half of the GGG fight trying to keep from getting hit by him, he went on the attack in the second half of the fight, and was hit hard on a number of occasions. Golovkin didn’t hit Jacobs a lot in the second half of the contest, but he did tag him with several powerful shots that had him close to being knocked out in the 10th. Golovkin’s ramrod jab did most of the damage to Jacobs’ face. By the end of the fight, Jacobs’ face was badly swollen everywhere. Jacobs looked like he’d fallen face first on concrete. He did not look good. In contrast, Golovkin’s face was mostly just sweaty, like he’d worked out on a heavy bag. In Jacobs’ three fights since then, he’s looked like a shell of his former self against Luis Arias, Maciej Sulecki and Sergiy Derevyanchenko. Jacobs came close to losing to Sulecki and Derevyanchenko, which might be the main reason why he was selected by Golden Boy Promotions to fight Canelo on May 4 rather than Jermall Charlo, Rob Brant or Andrade. The IBF no longer requires their champions to use second day weigh-ins. They did away with this rule after Golovkin’s fight against Jacobs. However, Golden Boy Promotions and Canelo will be bringing back the IBF’s old rule for the Jacobs fight on May 4. That’s not a bad thing. Secondary weigh-ins would mean lot more if they took place right before the fighter stepped foot inside the ring. By having them right as the fighter steps into the ring, there’s no chance for them to game the system by speedily rehydrating on the day of the fight. Ideally, fighters need to be fighting in the correct weight classes for their size rather than melting down to make weight for a division much lower than their natural weight. Having a hulking much bigger fighter beating up a small guy looks bad, and it hurts the competitiveness of the sport.